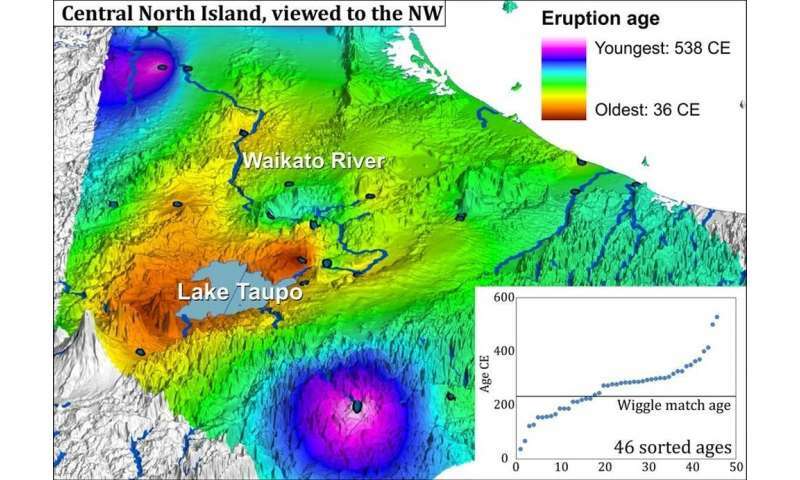 Now it seems that the Taupo eruption that occurred in the early part of the first millennium has been lying about its age. But like many lies, it was eventually found out, and it reveals exciting processes we hadn't understood before. Radiocarbon dating of organic material is based on the concentrations of radioactive carbon-14 in a sample remaining after the organisms' death. Over the past two decades, the method has been refined greatly by combining it with dendrochronology, the study of the environmental effects on the width of tree rings through time. 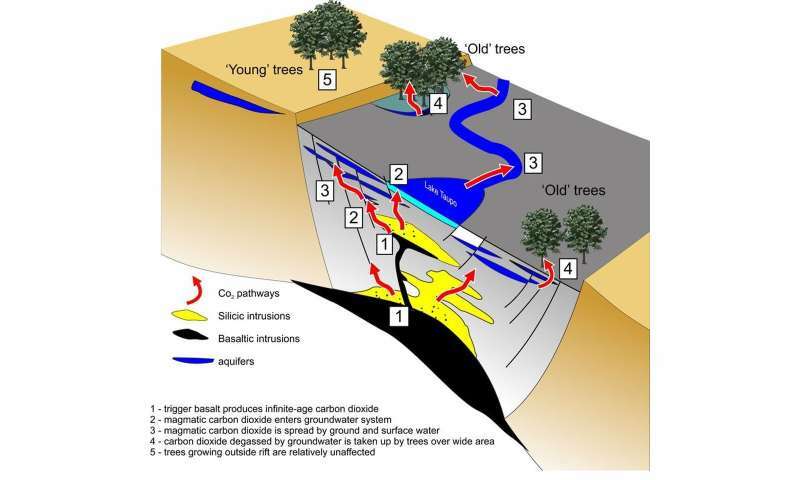 In principle, this composite record allows eruptions to be dated by matching the wiggly trace of carbon-14 in a tree killed by an eruption to the wiggly trace of atmospheric carbon-14 from the reference curve ("wiggle-match" dating). 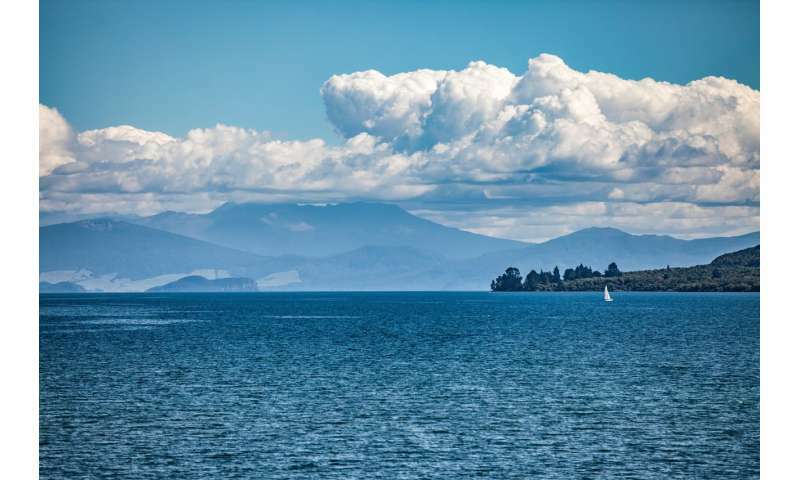 Our study shows that a large and increasing volume of carbon dioxide gas containing these stable isotopes was emitted from deep below the prehistoric Taupo volcano. It was then redistributed by the region's huge groundwater system, ultimately becoming incorporated into the wood of the dated trees. The precursory change in carbon ratios gives us a way to gain insight into the forecasting of future eruptions, a central goal in volcanology. We found that the radiocarbon dates and isotope data that underpin the presently accepted "wiggle match" age reached a plateau (that is, stopped evolving normally). This meant that for several decades before the eruption, the outer growth rings of trees had 'weird' carbon ratios, forecasting the impending eruption.